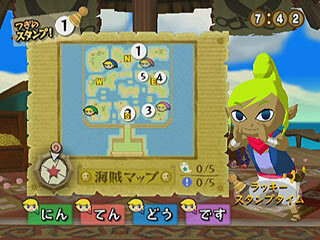 "Yo ho, find the treasures !" 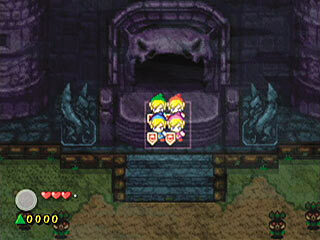 And the winner is... Link of course ! 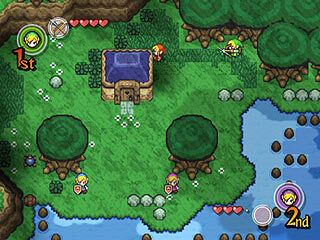 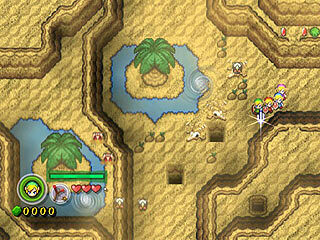 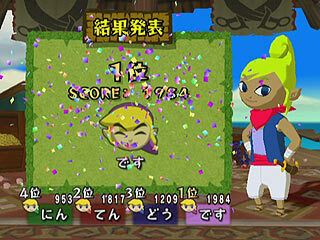 Extra: Tetra's Trackers mode (the 2 screenshots before the last) is only available in the Japanese game. 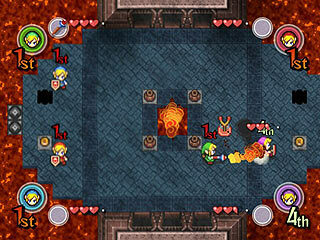 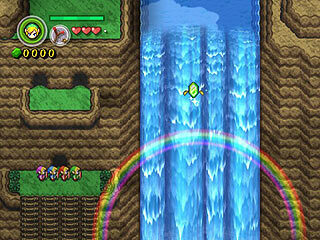 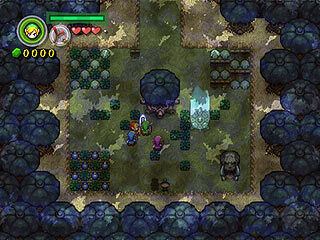 "The mission seems simple in this four-player competitive Zelda game: collect more Rupees than fellow players. 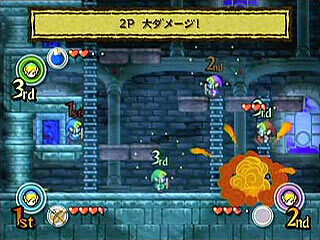 But as players explore a massive world that spans both the Nintendo GameCube and the Game Boy Advance, they must team up to solve puzzles and defeat enemies. 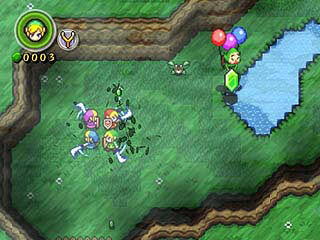 However, cooperative game play can be a daunting task when each person is looking out for number one! 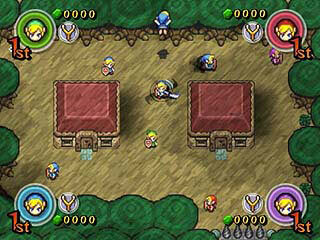 Pick up and carry rival players, use the boomerang to steal items, and prepare for heated competition with the countless items and enemies that define the Zelda series." 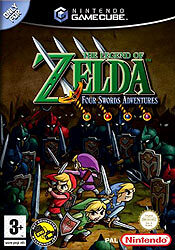 "- Control the game by connecting one to four Game Boy Advance systems to the Nintendo GameCube (no Game Pak is required for the Game Boy Advance). 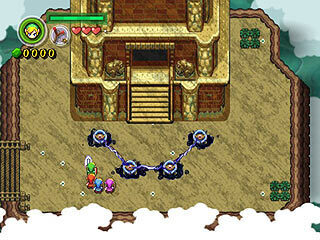 NB: you can also choose to play with the GameCube controller ! 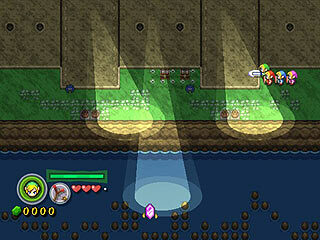 - Explore cooperatively on a single television--or duck into the underground world within your Game Boy Advance to see what lurks below. 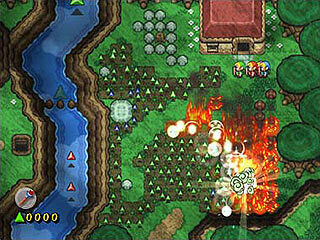 - Work together with other players to defeat enemies that go back and forth between the Nintendo GameCube and Game Boy Advance screens. 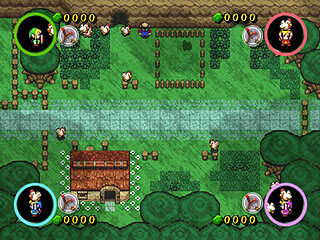 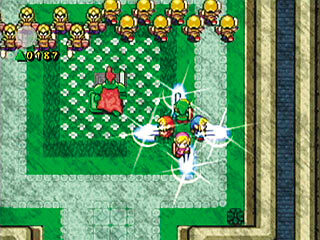 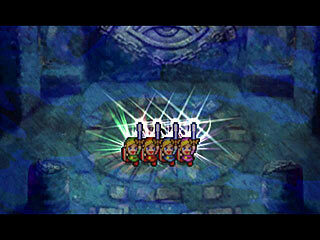 Control enemies on the Nintendo GameCube by hitting switches on the Game Boy Advance screen with their swords. 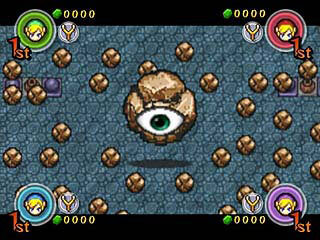 - Use strategy to find out where other players are on the Nintendo GameCube screen or where they're hiding in the caverns of the Game Boy Advance. 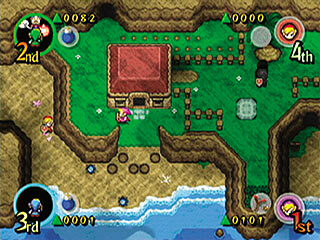 While players are inside the caves or houses, they can see secret messages on the Game Boy Advance screen or perform actions without others knowing."